Add instant festive charm to tabletops, mantelpieces and shelves with these special Christmas table decorations. 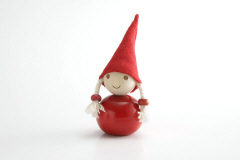 All tonttus are beautifully crafted from sustainable wood and made in Santa's homeland. 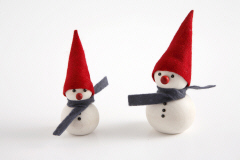 They make the perfect collectable Christmas table decorations - fun, festive, eco-friendly and durable. Capturing the magic of Christmas, tonttus are traditional ornaments that can be added to your collection of reusable Christmas decorations and brought out year after year for you to enjoy. These Christmas table decorations fit in perfectly with a traditional Yuletide or classic red, green and gold theme. They can also be used to complement or lift another colour scheme by adding a splash of red or white to your Christmas display. Tip: Place a single tonttu amongst the foliage on your mantelpiece or table centrepiece for an understated look, or group several tonttus together for more impact. Tonttus can also be used to add the finishing touch to your table place settings. Tip: You can can create a unified feel by using the same wooden table ornament for all place settings, or for a more personal touch, select the tonttu design that most represents that guest, friend or family member and mix-and-match. 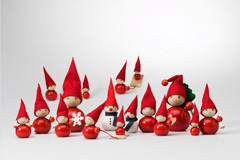 With fourteen different tonttu designs available, buy your wooden Christmas table decorations online now. An elegant alternative to baubles, these Scandinavian Christmas tree decorations make an enchanting addition to your Christmas tree. Angel Christmas tree decorations are a reminder of the true meaning of Christmas. Similar to the tonttus, these wooden Christmas decorations are made from sustainable wood and have a certain rustic charm. Lightweight and durable, they will not bend your Christmas tree's branches and as they are made from wood, are likely to outlast glass baubles. 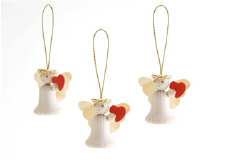 As well as the Herttainen angel Christmas tree decorations pictured above, Arctic Fashion stocks other angel Christmas decorations. 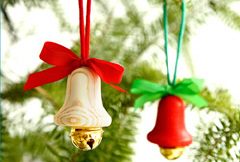 Add vibrancy to your Christmas tree with these wooden Christmas tree decorations. 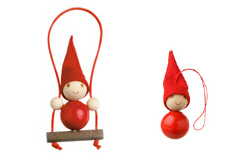 There's Tonttunen, the original Santa's elf design and Keinutonttu, a fun Santa's elf on swing design. Or, if you would prefer a lighter colour, but want the same rustic Scandinavian design, why not go for Lumiukko, the snowman Christmas tree decoration? Tiukukello Christmas tree decorations will liven up your Christmas tree. 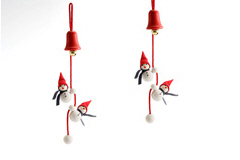 As well as having an appealing design, these jingle bell tree decorations make a dainty tinkling sound when shaken. They come in two colour combinations - red with green ribbon and bleached wood with red ribbon. Tip: Go for red to make a bright, festive statement or white for understated, Scandinavian chic. 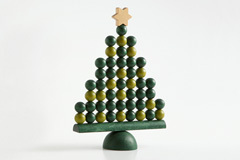 Buy wooden Christmas tree decorations online now. A no-fuss and eco-friendly Christmas tree ornament will create an interesting focal point. This contemporary Christmas table decoration makes an eye-catching centrepiece. Measuring approximately 27cm from the base to the tip of the star, this wooden Christmas decoration can also be displayed on a mantelpiece, tabletop or shelf. This striking Scandinavian design is made up of dual coloured green pearls topped with a star and attached to a wooden base. As it is made from sustainable wood, the Christmas tree decoration is not only environmentally friendly, but also lightweight and durable. This is a simple, no maintenance alternative to a real Christmas tree that will last a lifetime. Buy a Christmas tree table ornament online. These festive Christmas bells are an easy way of decorating the doors in your house. 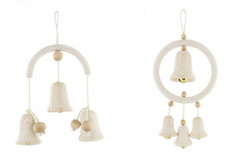 Make your home warm and inviting with these Scandinavian Christmas bell decorations. You can liven up plain doors simply by hanging one of these special door decorations. They make a gentle jingle bells noise as the door is opened and closed. There arewo varieties of wooden Christmas bell decorations currently available from Arctic Fashion. Dress up door knobs, wardrobe door handles, banisters and bed posts with a fun hanging decoration. The Pyrykellot door decoration is a simple, but effective way of adding festive fun to doors and bed posts. With two cute snowmen bell ringers and a red jingle bell, this special door decoration will capture the imagination of the smaller members of the family. When the door is opened or closed, the light tinkling will remind you of sleigh bells.